Jonathan Masih has done a commendable service to Christian historians by exploring and outlining the contributions of missionaries towards education in India. 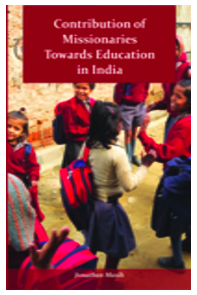 In his foreword to this important book, Arthur McPhee rightly calls it one of the “finest overviews” of the emergence and development of educational missions during the 19th and 20th century in the Indian subcontinent. A retired professor of Education from the University of Allahabad, Jonathan Masih also studied and taught at Akron University in Ohio. His collection on the famous Jeremy Bentham (philosopher and social scientist) is displayed at the University College in London. In its fourteen chapters the current book deals with several themes of historical significance. Some of those key themes include: (1) the origin of Christian missions in India, (2) the place of education in missionary enterprise, (3) attitude of government towards mission works, (4) educational policies and provisions in the mission agencies, (5) the Educational Dispatch of the year 1854, (6), organization, facilities and techniques of missionary education, (7) literary and linguistic works of the missionaries, and (8) the impact of missionary education in India. The book also contains brief survey of schools and educational system that existed prior to the arrival of missionaries. Its general scope extends to both Roman Catholic as well as Protestant missionaries in relation to education works. It also talks about all the mission societies from all denominations engaged in educational works. In addition, the contributions of celebrity missionaries, such as Christian Schwartz, William Carey, Alexander Duff, and James Ewing, have been briefly highlighted. The book consists of a useful bibliography of primary as well as secondary sources. It also includes some appendices with tables and charts showing statistics of schools, staff personnel, and enrolment of students. Unfortunately, the end-notes in some chapters appear to be incomplete and slightly misleading as the book includes chapter-wise references at the end. But that is just to do with the format and editing. As a historian of education and educational missions, Jonathan Masih has taken both chronological as well as thematic approach in his engagement with the subject. He also makes deliberate effort at being both comparative and complementary in his analysis. He does all these with an excellent use of the original sources. The book is an inevitable source for anyone interested in the history of education with special reference to Christian missions in India.